Girl Scout Inspired Samoa Pancakes | Amazing Homemade Pancake Recipe! These Samoa Pancakes are the perfect way to enjoy the popular Girl Scout Cookie all year round. Best of all, they’re soft, fluffy & made with layers of toasted coconut, melted chocolate & gooey caramel. Plus a video. 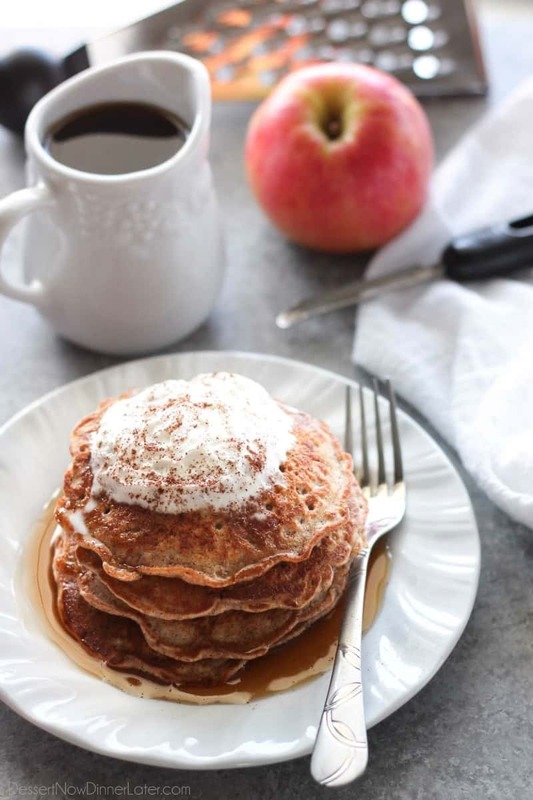 Breakfast is an absolute favorite around here, especially when fluffy pancakes are involved. My kiddos love seeing me pull out our griddle since they know I’m getting ready to whip up a large batch for them. I’ll usually wrap up the leftovers and toss them into the freezer to heat up on those lazy mornings or anytime we feel like having pancakes. And since it’s National Pancake Day today, I’m celebrating with my fellow Food Holiday Bloggers again and this time I brought these extra indulgent Samoa Pancakes to the party. 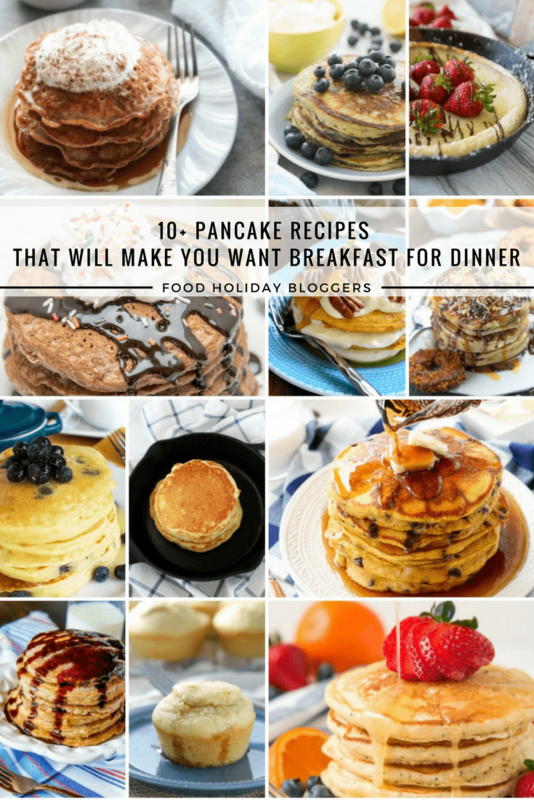 They start off with our favorite fluffy pancake base I use in my Blueberry Lemon Pancakes, Peach Cobbler Pancakes and Nutella Swirl Pancakes. 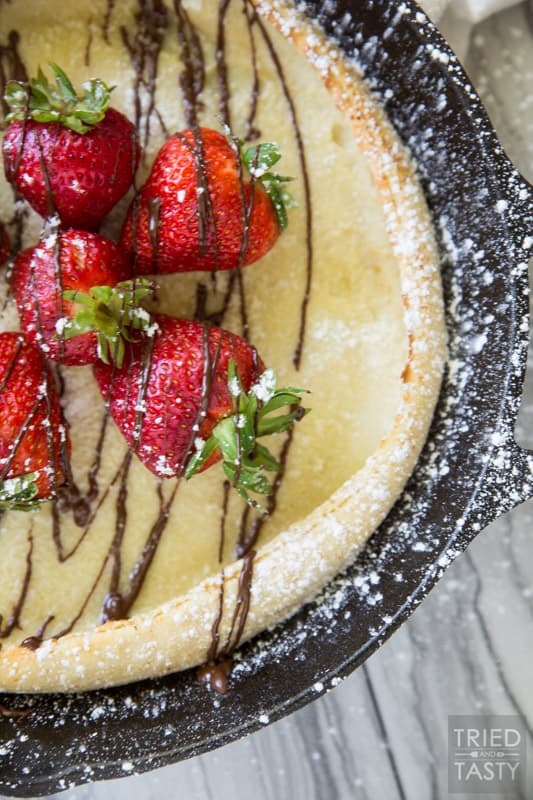 We leave out the fruit and Nutella and add coconut extract instead of lemon or vanilla. 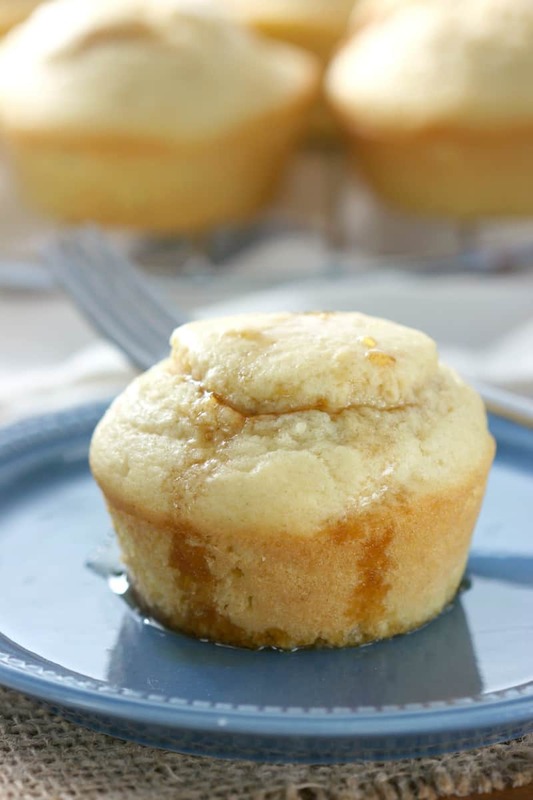 The Greek yogurt keeps them nice and fluffy and if you want an extra coconut kick, you can totally use coconut yogurt and coconut milk for the batter. Once they’re cooked up, we simply layer a platter of two or three pancakes with some melted chocolate, gooey caramel sauce and some toasted coconut. They’re completely decadent and perfect for those special moments when you need an over the top treat. 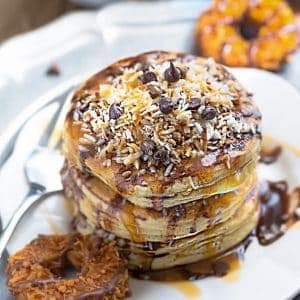 They have all the flavors of the popular Samoa cookie so if you’re a Girl Scout cookie fan, you will definitely fall in love at first bite with these pancakes. 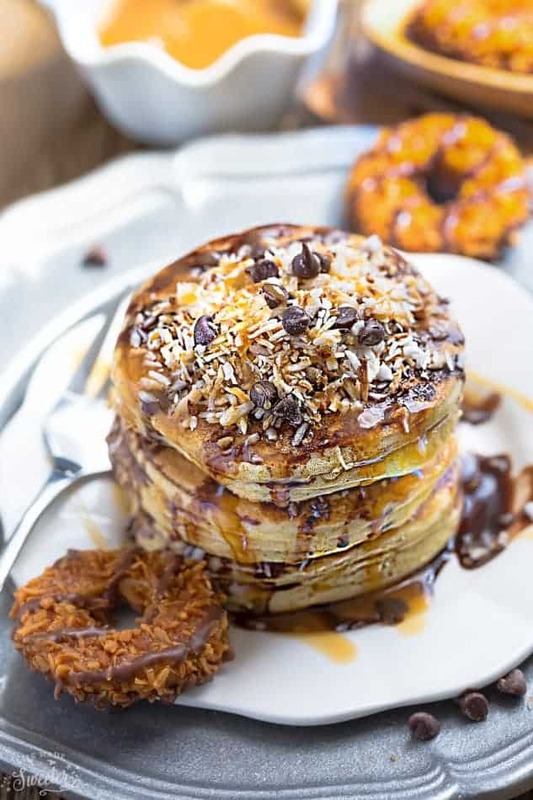 These Samoa Pancakes are made with layers of toasted coconut, melted chocolate and gooey caramel - all the flavors of the popular Girl Scout cookie. Preheat a griddle or a large skillet to medium heat and lightly grease with cooking spray. In another bowl, whisk the Greek yogurt, coconut, and milk together. Slowly beat in eggs until well incorporated. Stir wet ingredients into dry ingredients and mix until just combined. Over mixing will result in less fluffy pancakes. Scoop about 1/4 cup batter onto the preheated skillet. 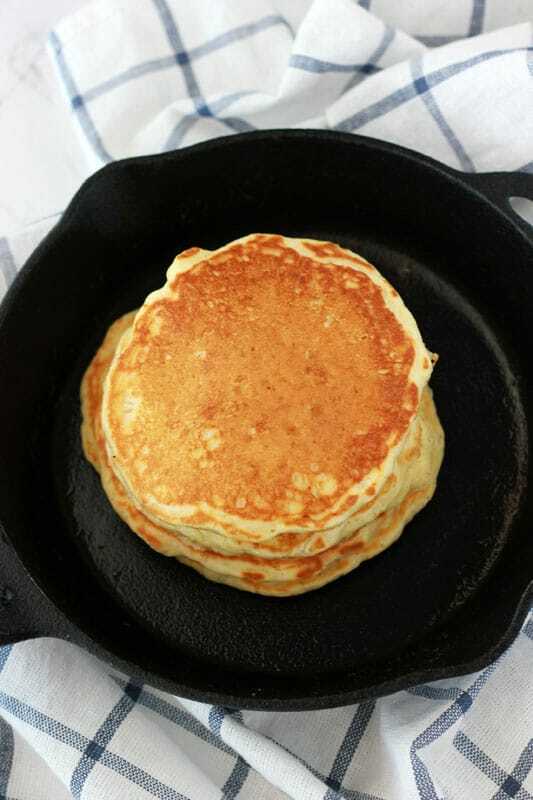 If the batter is too thick, flatten pancakes with your spatula. When bubbles begin to appear on the surface, flip carefully and cook for about 1 to 2 minutes more until browned on the underside. 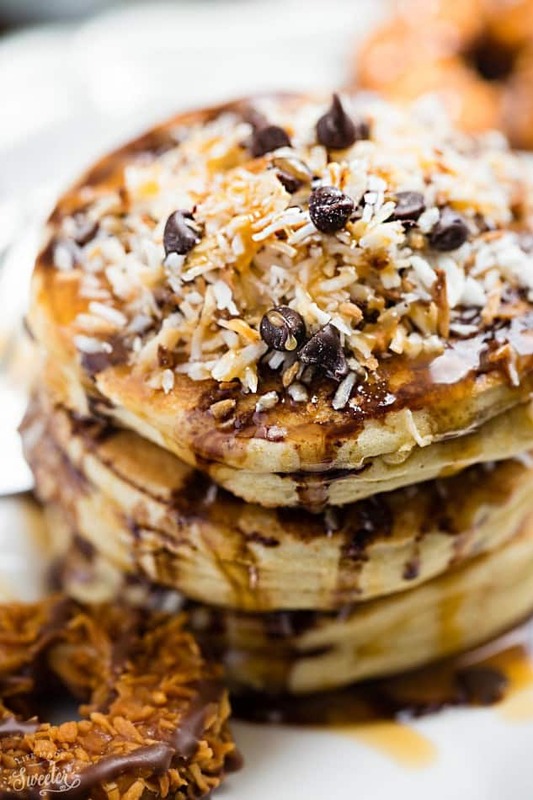 When ready to serve, place one pancake on a plate and sprinkle with coconut, chocolate and a drizzle of caramel sauce. Top with another pancake and repeat toppings. Add the final layer of pancakes with toppings and sprinkle with chocolate chips. Serve warm and enjoy. So very fluffy and soft!! Excellent, Kelly. Breakfast is a favorite in my house, too! And homemade pancakes are the best! I had no idea it was National Pancake Day! What a perfect recipe to share, Kelly! Your pictures are just gorgeous, and I love the samoa flavor! You make the BEST pancakes ever, Kelly! 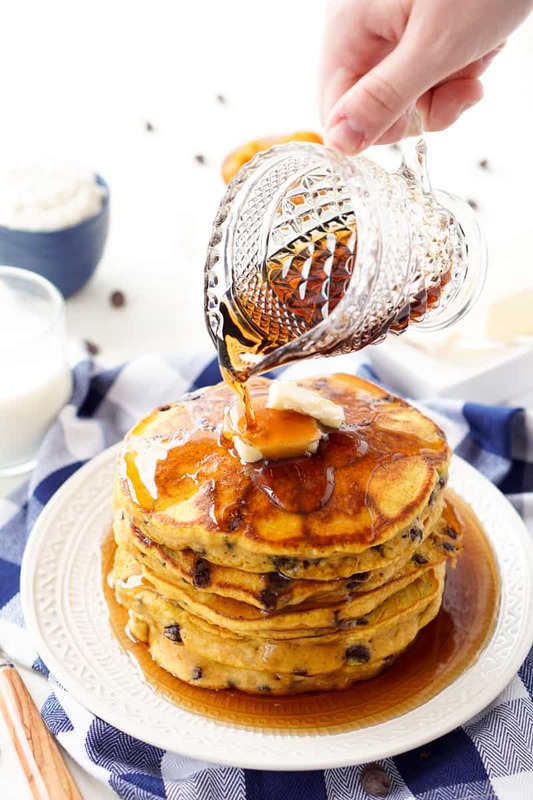 I’ll bet your lucky kiddos gobbled these amazing pancakes right up! They look completely AMAZING!! Oh my word Kelly! Samoas are pretty much the BEST thing ever. Why have I never made them into pancakes! Definitely trying this with the kiddos one weekend — I know they’ll love them! How did I miss the memo that today is national pancake day?! Well, thank God for you, Kelly! 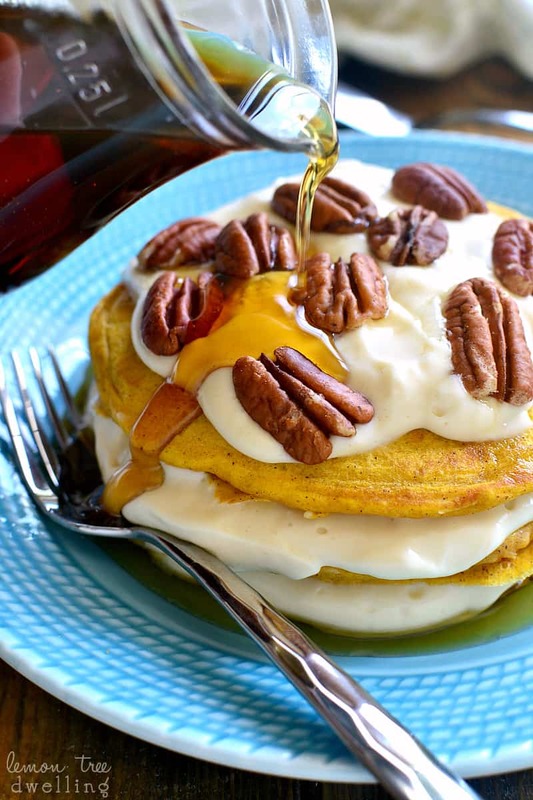 Totally know what I’m doing for dinner tonight – THESE fabulous pancakes! Seriously, these look beyond amazing, girlfriend! Samoa cookies in pancake form?! GENIUS! Pinned! Cheers, chicka! Kelly, are you kidding me right now with these AMAZING pancakes?!! OH MY GAWD!!!!!! Epic! My husband saw these and immediately decided we should have them for dinner. They look delicious! I had no idea it was National Pancake Day, so thank you for telling me! Samoa cookies were always one of my favorite Girl Scout flavors, and they would be even better in pancake form! Oh, what a treat for breakfast! It looks amazing and these pancakes couldn’t be fluffier. I love how your mind thinks. It’s not only delicious but so fun to sit down to with the family. You got me wishing it was the weekend again and time for breakfast! 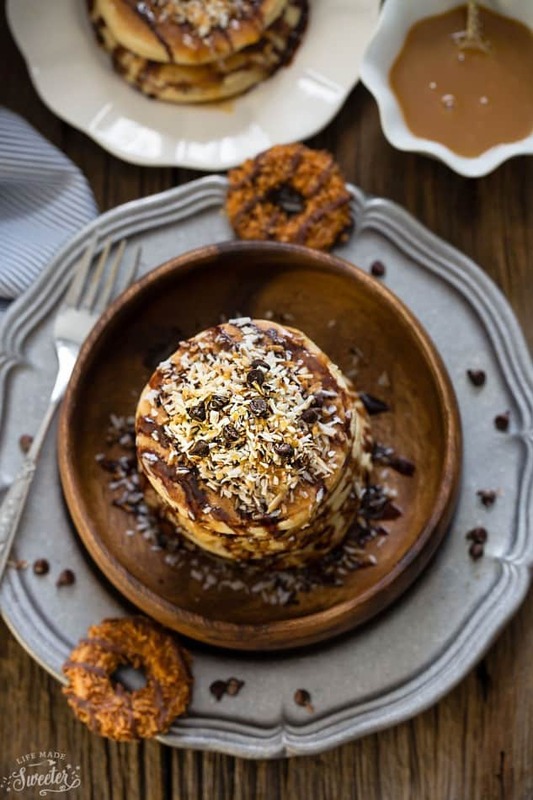 I can’t get enough of your samoa desserts! 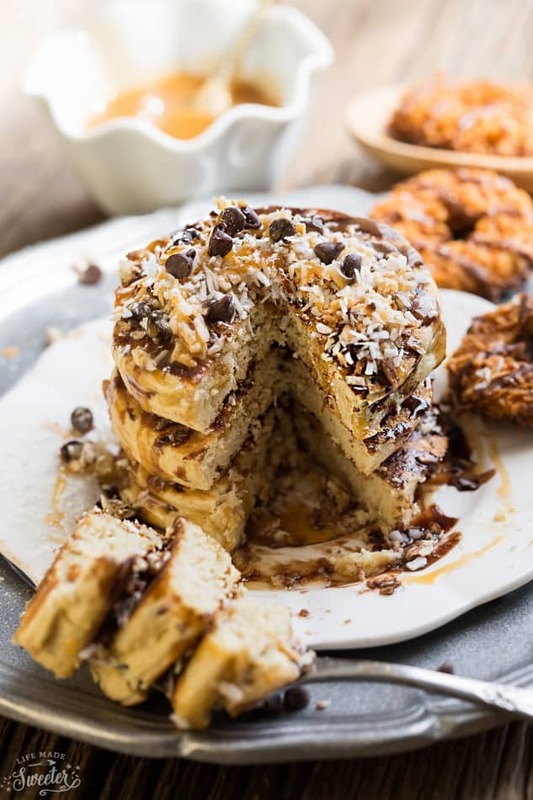 I would have never thought to make pancakes with samoa flavors, but these look phenomenal! 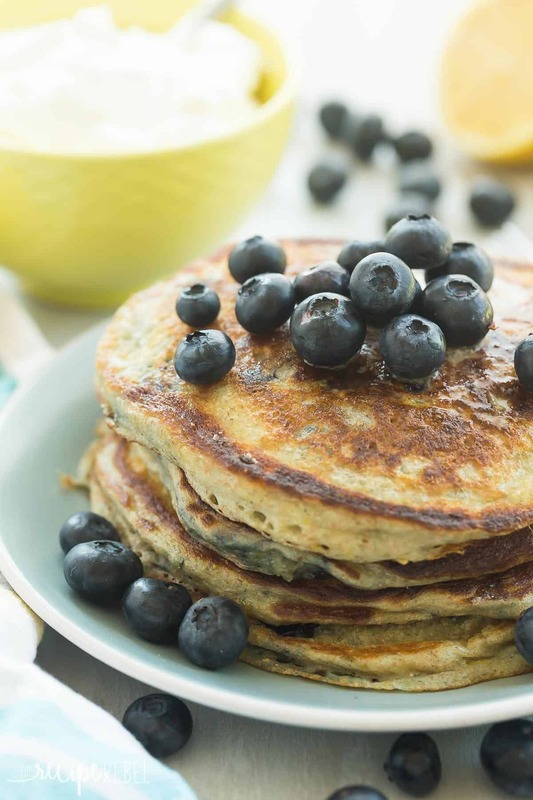 I love all your pancake recipes Kelly and this is no exception, sounds delicious! Woah! 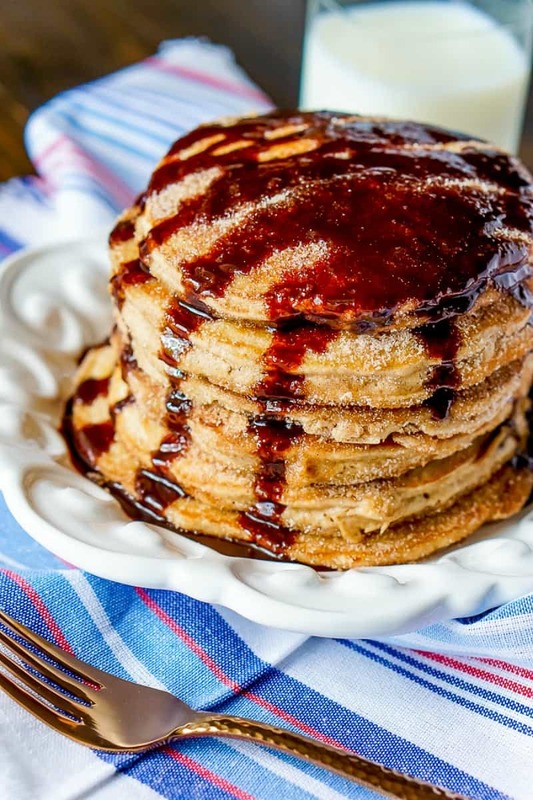 These samoa pancakes look amazingly delicious, Kelly! Love how easy and fun to make them. I loved watching your video too! Wow! What a great idea Kelly, I bet these pancakes taste amazing! These have to be some of the best looking pancakes I’ve come across! They look incredible, Kelly! How in the world did I miss national pancake day?!?! Can we have a do-over so I can have some of these delicious somoa pancakes? And now I wish I were cozying up with some Girl Scout Cookies – LOL! These are made with whole wheat flour and Greek yogurt so I don’t even have to feel bad about them? SWEET. They look divine! My favorite cookie as breakfast? SO. IN. You make the best pancakes, Kelly! I love the samoa flavors and wish I had a tall stack right now! 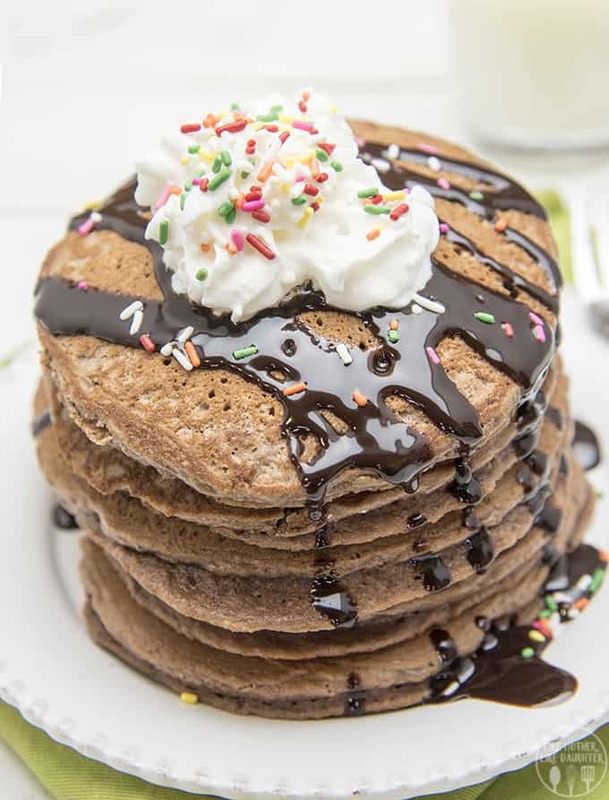 Wow, awesome pancakes…I would love to have these for breakfast…and they look so fluffy and light. What’s better than cookies for breakfast? Cookie flavored PANCAKES for breakfast, of course! These look SO darn tasty. I’ve gotta try them soon! 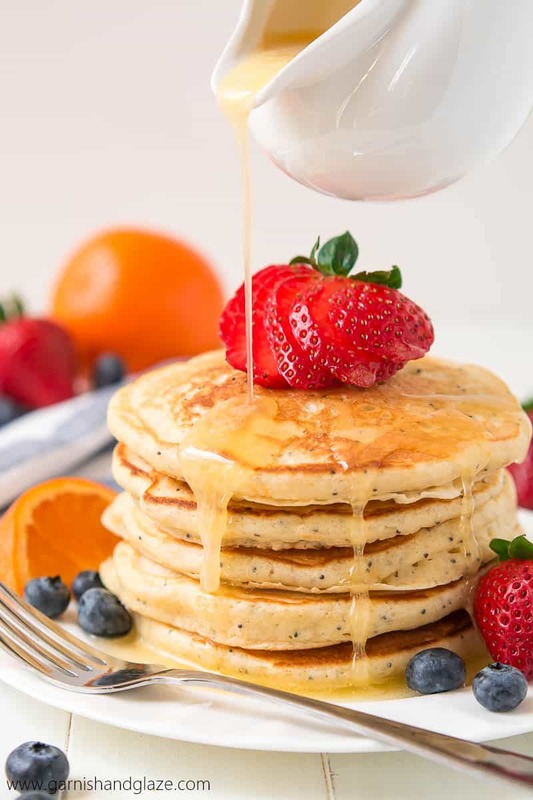 So soft and fluffy and tempting 🙂 These pancakes look amazing Kelly. 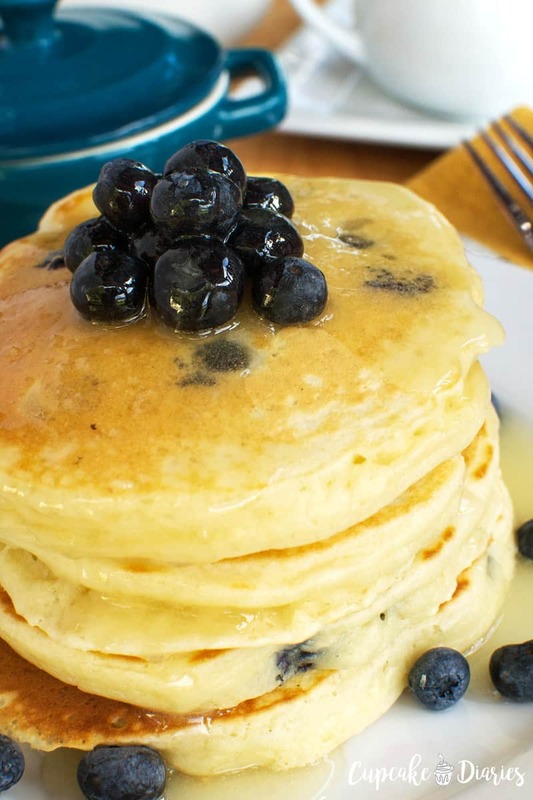 Could these pancakes be any more perfect?! Love how fluffy they are Kelly they look great!